Engelman Berger P.C. 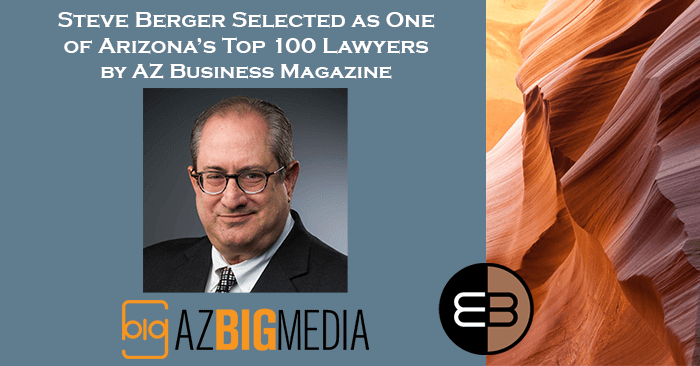 congratulates attorney and EB co-founder, Steven N. Berger, for being named by AZ Business Magazine as one of the “Top 100 Lawyers in Arizona for 2019.” Steve’s practice areas include: bankruptcy and reorganization, creditor’s rights, loan workouts, business restructurings, business and real estate disputes, and mediation. Every year, AZ Business Magazine announces its pick of Arizona’s Top 100 lawyers. The distinguished group is chosen by the publication’s editorial team in collaboration with industry experts from a pool of more than 2,000 of the state’s most talented and successful attorneys. Each lawyer is selected based on their professional success and ratings, impact on his or her law firm, impact on the communities he/she serves, and impact on the legal profession as a whole. Before the founding of Engelman Berger PC in 1999, Berger was an associate and partner at two of Arizona’s largest law firms. He has extensive experience in representing parties involved with troubled loans or troubled businesses, and has represented lessors, business owners, investors, asset purchasers, creditor committees, and other parties in bankruptcy and reorganization cases, as well as in general business issues and business disputes. He utilizes his experience as an advocate and also as a mediator in bringing closure to unresolved disputes. Steve has almost 35 years’ experience in representing clients throughout Arizona and has been recognized in The Best Lawyers in America, Super Lawyers® and Super Lawyers® Top 50 Arizona Lawyers, Arizona Business Leaders and for many years in the Top 100 Best Lawyers in Arizona.